Hopefully there won’t be any more posts like this for a long while. 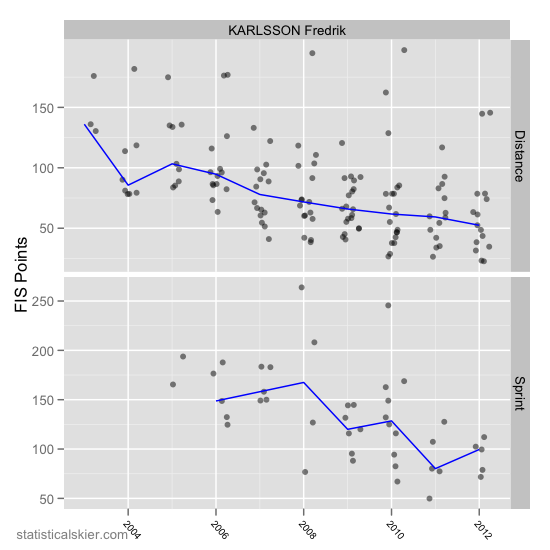 Fredrik Karlsson died recently, I guess in a snowmobile accident. I didn’t know much about him, but I guess he was on Sweden’s development team. As you might expect for someone on Sweden’s development team, he hadn’t quite made a huge splash in World Cup races, having never cracked the top 30 in a distance race, and he’d only done one WC sprint race. Posted by Joran on Friday, April 27, 2012, at 6:00 am. Filed under Cross Country. Tagged fredrik karlsson, men, sweden, World Cup. Follow any responses to this post with its comments RSS feed. You can post a comment or trackback from your blog.